Are you an entrepreneur in need of free business advice? If so, we may be able to assist you through our project that offers services for free to qualifying seed and early stage entrepreneurs in need but unable to afford an attorney on their own. 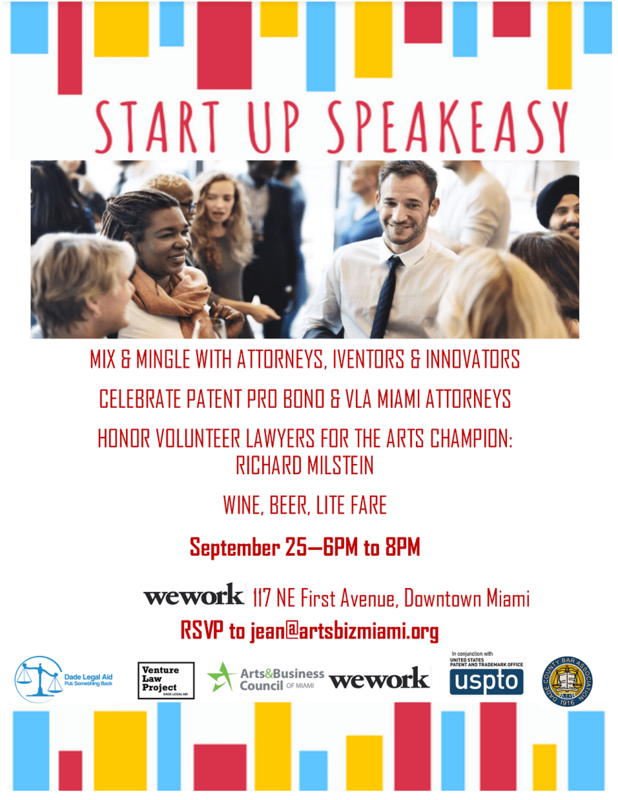 The project leads and supports Miami’s growing entrepreneurial community by serving as a hub for emerging startups across South Florida. 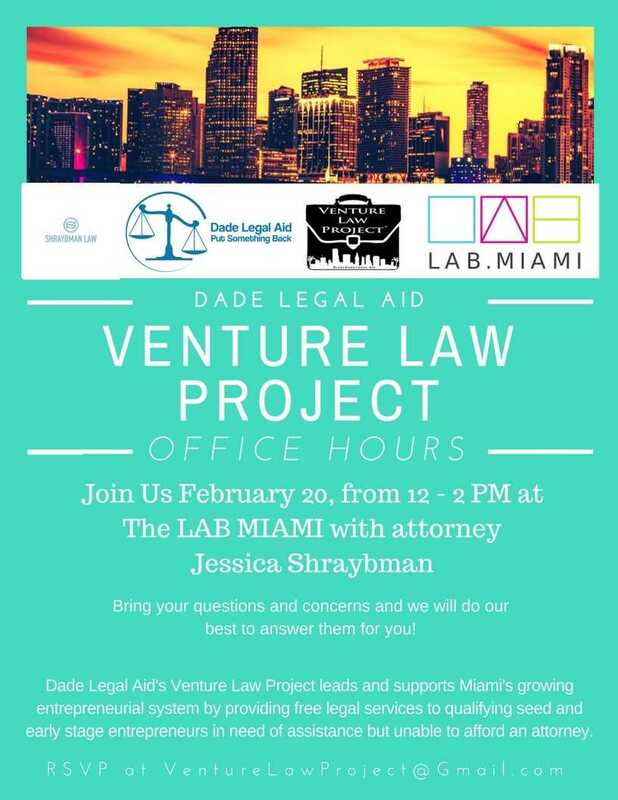 Dade Legal Aid helps startups grow on solid legal footing by matching them with knowledgeable and dedicated pro bono attorneys who screen cases, staff clinics, lead workshops and accept cases. To apply for services, CLICK HERE to request an application or you may apply in person at 123 NW 1 Avenue, Miami, FL 33128 or call 305-579-5733 ext. 2247 or 2249. Please submit a budget and attach financial documents to verify the financial affidavit (latest bank statement of startup’s bank account, individual bank account, or latest income tax filing). Each application is confidential and is reviewed for income eligibility, merit of case, and potential to proceed to accomplish goals. We cannot guarantee that we can accept every case. If you misrepresent yourself, miss appointments or are overincome, you will be rejected by the project. You represent yourself until or unless a volunteer lawyer with the project agrees to represent you. 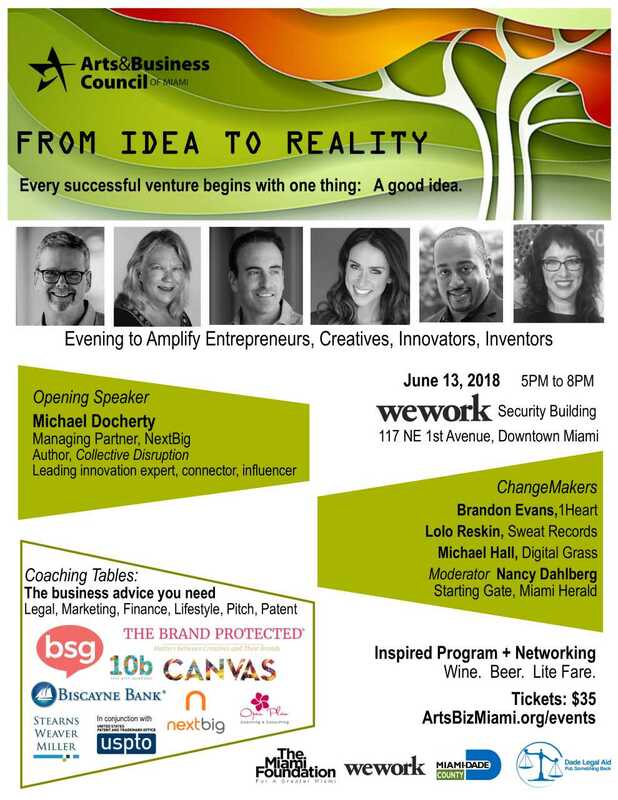 February 24 – Jessica Shraybman, Esquire, facilitates a discussion at The Wolfsonian-FIU, Miami Beach, in Collaboration with Brand New Mornings to bring business coaching, inspiration, and community to creative entrepreneurs. 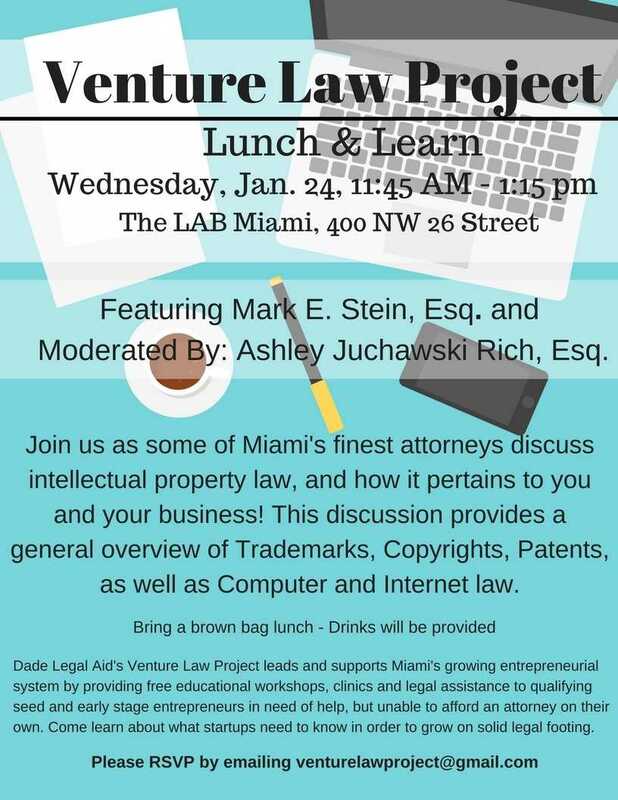 January 24 -Mark E. Stein, Esquire and Ashley Juchawski Rich, Esquire, lead Lunch & Learn at The LAB Miami. 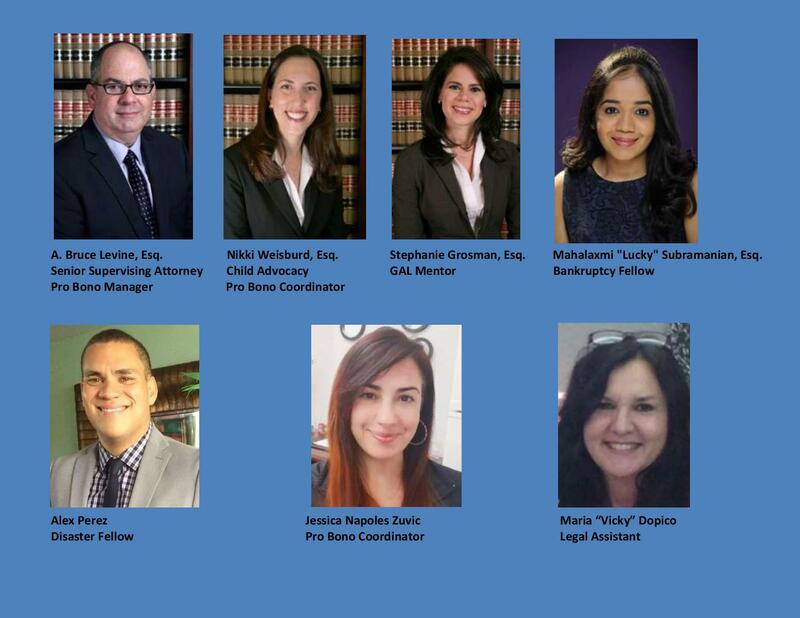 ​To apply for services, please email the project coordinator to request an application or a free consultation with one of our pro bono attorneys. CLICK HERE. ​Want to volunteer? Corporate and intellectual property pro bono attorneys who are licensed in Florida may donate their time to the project in areas such as incorporation, intellectual business formation, filing requirements, drafting and negotiating contract and lease agreements, licensing, tax advice, registering copyrights, trademarks, patents, a legal hotline and clinics. Florida Patent attorneys participate by helping clients protect proprietary aspects of their inventions via Dade Legal Aid, Miami’s oldest provider of free civil legal aid to qualifying low-income populations. Participating pro bono attorneys receive credit via Put Something Back. Want to Donate? CLICK HERE. to support our efforts. Retired and want to Mentor? Let us know if you have time to share your expertise. We are in search of seasoned business attorneys who are no longer practicing but want to help with client screening and mentoring newer attorneys. .